Bear Archery has been manufacturing top-quality traditional bows since the 1940s. Today, we carry a selection of their very best recurve and longbows. If you�re interested in traditional shooting, you�ll want to check out the designs that helped propel the sport forward. The company�s co-founder, Fred Bear, was an avid bowman and big game hunter who honed the designs of the products based on what his needs were in the field. Similarly, the staff at Outdoors Experience have hands-on experience with all of the products we sell. If you have any questions, don�t hesitate to ask for help. The Bear Sonoma Takedown recurve bow for sale is impressive in construction and classic in design. With a length of 60�, it meets the needs of many experienced archers. Made of layers of laminate, the bow�s limbs are sturdy and responsive. It�s a beautiful bow at an excellent price! The design of the Bear Grizzly recurve bow for sale has remained unchanged since 1964. You�ll love the look of the red Dymondwood riser against the limbs� maple and black fiberglass. The Grizzly is an industry icon and a bow purchase that can�t miss the mark. Another manufacturer favorite is the Bear Super Kodiak recurve bow, which replaced the Kodiak line in 1967. With a 60-inch AMO length, it has substantial spread for hunting big game. Maple and black fiberglass legs and white and black fiberglass tips create a strong and durable bow capable of withstanding regular use, and the two-piece riser of black and brown Dymondwood put the finishing touch on a sleek and sophisticated style. Younger archers will enjoy the Bear Bullseye X Takedown Recurve Bow, targeting ages 12 and older. It comes in three basic sizes and features multi-laminate limbs. The sturdy design is a reliable option for archers of all ages. Of course, the ultimate child bow is the Bear Kodiak Cub recurve bow. Replacing the Little Bear in 1969, the Kodiak Cub offers budding bow enthusiasts smooth operation and excellent results. With a 48-inch AMO length and its maple and black fiberglass construction, users will have the size and the power they need to push their bows to the limit. 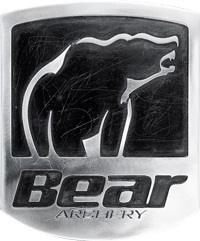 Bear Archery is a manufacturer with a long-standing reputation. At Outdoors Experience, we�re proud to have a robust selection of traditional bows reinforced with functional designs and high-quality materials.